Colorado is a relatively new state, in the grand scheme of things. While Delaware was the first state to officially join the Union in 1787, we’ve only been a state since 1876. If you do the math, that’s 138 years. So it’s kind of crazy — and crazy impressive — that the Durango and Silverton Narrow Gauge Railroad is celebrating its 131st year! Narrow Gauge Days kicks off next weekend, May 2-3, to mark the Durango train’s continuous operation to Silverton since 1882. Get the party chugging along with the annual free picnic and community party at the Durango depot in downtown. An army of volunteers will grill up some hot dogs and serve up sides and soda from 11 a.m. to 2 p.m. while the Bar D Wranglers strum up a storm during the festivities. 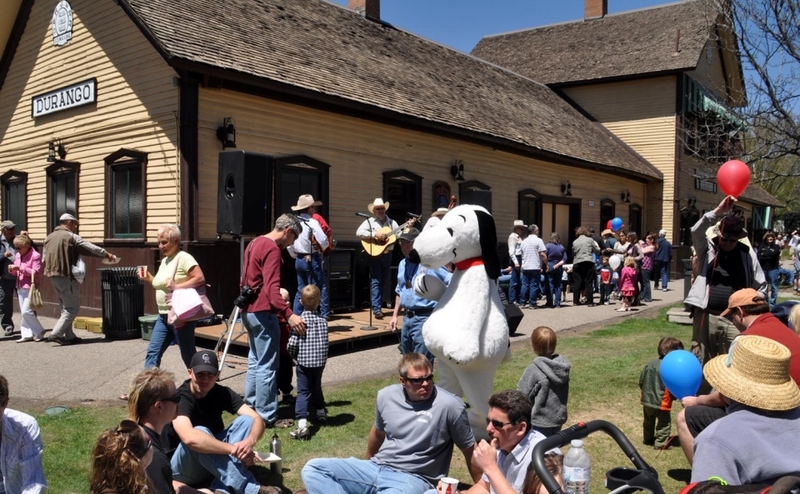 Keep your eyes peeled for some of the regular passengers on the Durango Silverton train: Snoopy, Victorian-era ladies and gentlemen, and maybe some others in costume. Several passenger cars will be on display, including the Durango railroad’s newly remodeled, first-class coach, “Yankee Girl.” If you get to the celebration early enough, you can pick up a free tree seedling to plant in order to help offset the railroad’s carbon footprint. For the countless time in 131 years, the Silverton train will depart the Durango depot at 8:45 am and will arrive in Silverton at 12:15 p.m. During the trip, passengers can enjoy a bit of history as told by “pioneers” who will be on board. When passengers arrive, they’ll be greeted by fun, festivities and food as well as a few Silverton residents wearing Victorian-era costumes. In Silverton, before the train arrives, the Durango and Silverton railroad will also serve a complimentary Continental breakfast at the Silverton depot at 10th and Cement streets from 10-11:30 a.m. The Durango train is one of the few places in the nation where visitors can still experience a historic train ride. The Durango and Silverton Narrow Gauge Railroad still uses a coal-fired, steam-powered locomotive and historic passenger cars that travel on the same rails that settlers rode more than a century ago. The train follows the Animas River as it winds through canyons and past waterfalls and wildlife in San Juan National Forest. While you’re in Durango for Narrow Gauge Days, be sure to stay and take in the town. Book your room with us at the Durango Quality Inn — we’re just a mile up Main Avenue from the depot!